Partnership provides credit union members with exclusive benefits and discounts. This relationship not only provides us with the opportunity to improve the financial well-being of their employees, but enables us to touch the lives of more people visiting the park. The Official Bank of Six Flags Over Texas and Hurricane Harbor is a credit union. 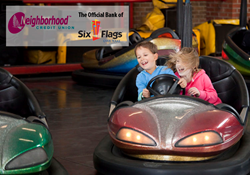 Neighborhood Credit Union is in its third year as The Official Bank of Six Flags Over Texas and Hurricane Harbor with an exclusive partnership for employees that began in 2010. The partnership also includes multi-platform media branding throughout the park and online, and provides credit union members with money-saving benefits and exclusive experiences. Six Flags Over Texas announced that starting July 4th, the new BATMAN™ The Ride BACKWARDS will open for a limited-time this summer, and Neighborhood Credit Union members can take advantage of discounted ticket prices throughout the season. The partnership offers credit union members exclusive benefits and discounts, resulting in additional savings. The credit union will also host an exclusive Early Ride Time Event on October 4th at Six Flags Over Texas, where members and potential members will be permitted to arrive at the park early and enjoy some additional perks without crowds or lines. About Six Flags Entertainment Corporation: Six Flags Entertainment Corporation is the world’s largest regional theme park company with $1.1 billion in revenue and 18 parks across the United States, Mexico and Canada. For 53 years, Six Flags has entertained millions of families with world-class coasters, themed rides, thrilling water parks and unique attractions including up-close animal encounters, Fright Fest® and Holiday in the Park®. For more information, visit http://www.sixflags.com. About Neighborhood Credit Union: Neighborhood Credit Union, the oldest credit union in Dallas (chartered April 18, 1930), is a not-for-profit financial organization serving Dallas and Ellis counties, as well as the city of Arlington. With branches in Oak Cliff, North Dallas, Richardson, Arlington, Mesquite, Duncanville, Waxahachie, Lancaster, Grand Prairie and Coppell, and assets topping $350 million; Neighborhood Credit Union has a membership of 32,000 and continues to welcome new members daily. For more information, call (214) 748-9393 or visit http://www.myncu.com.